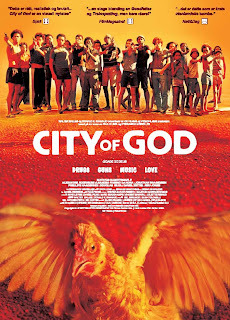 Based on true events, you can almost smell the sweat, the groove, the heat and the rebellious madness of youth that the characters exude even as Rocket, one of the many denizens of the notorious slum in Brazil - the City of God, finally finds what he wants to do. It is his story and the story of other people who crowd the world of crime, robbery, drug-peddling and the dream of escaping the slum. Even the subtitles can't extinguish the arresting tale of human beings so desperate to live, whatever the implications. You will be lucky to catch it at some film festival. Meanwhile, catch it on DVD.